Is Charlie Coyle Destined for Greatness? On June 24, 2011, forward Charlie Coyle was acquired by the Minnesota Wild along with Devin Setoguchi and a first round pick in exchange for a second round selection and veteran Brent Burns who joined the San Jose Sharks. Coyle has excelled throughout his hockey career and recently earned a spot with the Wild last season. 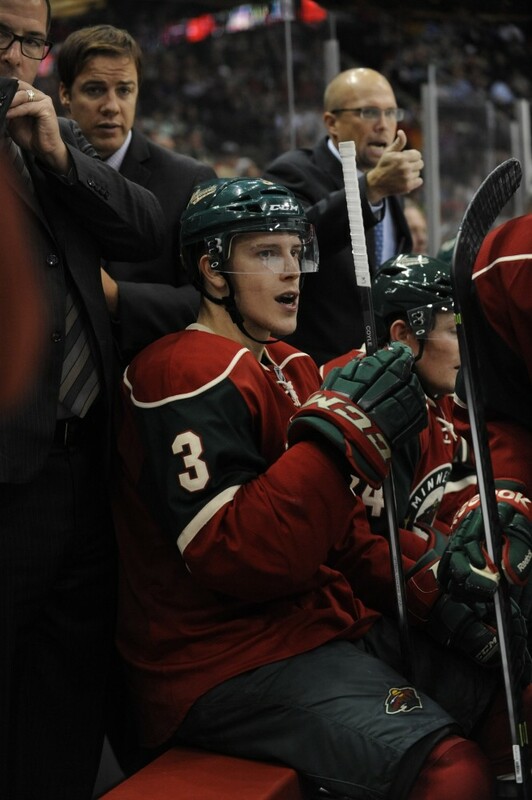 In thirty-seven games with the Wild last year, Coyle had fourteen points scoring eight goals and six assists. In order for the Wild to be successful this year, the club will need a strong effort from its young players. Coyle played well for the Wild last year and this has continued so far for the youngster in the preseason. As a result, Coyle has solidified a spot in the Wild’s top six. Coyle’s performance impressed many fans and analysts alike last year and it has many wondering if he is on the cusp of a breakout year. Coyle’s road to the NHL has been paved by his skill on offense, his strong work ethic, as well as his never back down physical game. The young forward has a strong offensive presence that has been shown throughout his career. Coyle began showcasing his talents at a young age as a member of Thayer Academy’s ice hockey team in Braintree, Massachusetts. Other notable NHLers who played ice hockey for Thayer Academy include defenseman Brooks Orpik of the Pittsburgh Penguins as well as NHL alumni forwards Tony Amonte, who is also Coyle’s cousin, and Jeremy Roenick. Coyle excelled as a member of Thayer Academy’s ice hockey team. In the 2008-2009 season, Coyle scored twenty goals and twenty-eight assists in just twenty-six games. His outstanding play lead many analysts to consider him among the elite high school hockey players in the country. After playing at Thayer Academy, Coyle played forty-two games for the South Short Kings in the Eastern Junior Hockey League. He continued to display his offensive talents scoring twenty-one goals and forty-two assists during his career with the Kings. He excelled in the EJHL being named the league’s rookie of the year during the 2009-2010 season. Not only was Coyle ranked near the top of the list among US high school ice hockey players but he was listed as an “A” level prospect by NHL Central Scouting Service. Coyle committed to play for Boston University but he dreamed of playing in the NHL. The “A” prospect rating meant that many NHL scouts viewed him as a potential first or second round pick in the 2010 NHL Entry Draft so his NHL dreams were on track to becoming a reality. Minnesota would take forward Mikael Granlund with their ninth overall selection in the 2010 NHL Entry Draft . However, there was no doubt that the Wild thought highly of Charlie Coyle’s offensive talents. 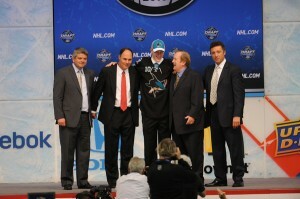 Coyle was selected in the first round, twenty-eighth overall, by the San Jose Sharks but his time as a San Jose prospect would be short-lived. After being drafted by the Sharks, Coyle attended Boston University and spent time playing for the school in the NCAA. With Coyle being involved in a college hockey program, he was unable to sign an entry-level contract with the Sharks. However, the young forward continued to refine his game at the NCAA level. He finished his career in the NCAA scoring 0.75 per game. In fifty-three games played Coyle scored ten goals and thirty assists. He was named to the NCAA – Hockey East All-Rookie Team and was named rookie of the year. A few months before he was traded by the San Jose Sharks, Coyle transitioned from the NCAA to the QMJHL where he played for the Saint John Sea Dogs. He made this transition in December 2011 in order to make himself eligible to sign an entry-level contract. In an offense focused league, Coyle’s game continued to impress in the QMJHL. He scored fifteen goals and twenty-three assists in just twenty-three career games with the Sea Dogs. 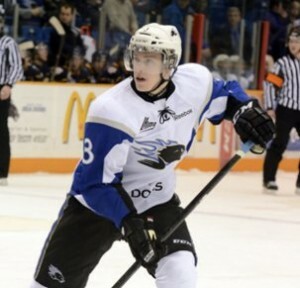 His efforts in the 2011-2012 playoffs earned him the QMJHL Playoff MVP award. The Minnesota Wild signed Coyle to a three year entry-level contract shortly after they acquired him. With his stellar play in tow, signing Coyle to an entry-level deal was a no-brainer for the Wild. Coyle spent time in the AHL last year with the Houston Aeros where he scored fourteen goals and eleven assists in forty-seven games. Will Coyle Excel at the NHL Level? This year could very well be a break out year for the young forward. Many predicted that Mikael Granlund was the youngster to keep an eye on last year but his game has not yet reached its full potential. While many eyes were on Granlund Coyle steadily improved and quickly began establishing his game in Saint Paul. There are many reasons why this could be a breakout season for Coyle. As a member of the Wild last season, Coyle showed great poise and awareness as he continually improved on a night-to-night basis. He used his size and his puck possession skills to his advantage. Coyle gradually became a consistent contributor for the Wild helping the club in their transitions and in other key situations. Overall, Coyle meshed well with the Wild’s system and had a solid rookie campaign. Coyle spent time last year playing on the Wild’s top line with forwards Zach Parise and Mikko Koivu. The Wild’s plans for their first line changed last April with the arrival of forward Jason Pominville after a trade with the Buffalo Sabres. Pominville will likely play with Parise and Koivu on the top line this season. Coyle is slated to play on the Wild’s second line for the upcoming season. Coyle’s role on the second line has the potential to generate opportunity for the young forward. As opposing teams match their shut-down lines against the Wild’s top line, this may create an ideal situation for Coyle to elevate his game on the second line. The young forward is well-positioned to take advantage of these circumstances and play an even more prominent role on the Wild’s top six. Coyle showed steady improvement last year as he gained more experience at the NHL level. The youngster will need to contribute consistently to keep his spot on the second line. If he performs to expectations, the sky is the limit on what Coyle can accomplish this year. Another reason why this could be a breakout year for Coyle is because of the fact that his linemate, forward Dany Heatley, is in the final year of his contract. Heatley likely will not return to the Wild after this season. 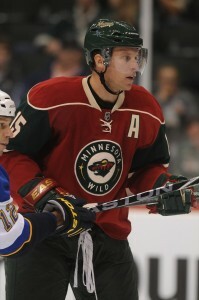 However, this is a big year for Heatley who will need to prove he can still put up big numbers to earn a new contract. Heatley was a factor in the Wild’s success in the early-going of last season. He notched eleven goals and ten assists in thirty-six games. However, Heatley was sidelined with an injury in early April that ended his season – he also did not play for the Wild in the playoffs. Heatley’s production has dropped off in recent years. He scored just fifty-three points during the 2011-2012 season, his first full season with the Wild. This is a long ways away from his career high of one hundred and five points set during the 2006-2007 season as a member of the Ottawa Senators. The veteran has scored fifty goals twice in his career, is a former Rookie of the Year, and a former first-team All-Star. While he hasn’t reached this level of offensive production in a few years, the forward is eager to silence his critics and prove he is still an offensive threat. Heatley is also slated to play on the second line and he has established some early chemistry with Coyle in the preseason. In five preseason games, Coyle has been impressive scoring three goals and one assist – Heatley drew an assist on two of Coyle’s preseason goals. While it is only the preseason, the fact that Coyle and Heatley are already generating offense is a great sign. A full season together could not only benefit both players but it potentially could give the Wild a potent offensive threat on the second line. Coyle has continued to elevate his game at each level. Now that he has earned a spot with the Wild, he has all the potential to develop into a solid power forward for the club. Minnesota hopes to build upon the success of last season by again qualifying for the playoffs and making a deeper run. To reach the next level, the Wild will heavily rely on their young players so Coyle figures to be an essential piece to this year’s puzzle. Given his impressive playing career, his work ethic, and his offensive skill set, this year has the potential to be a breakout year for Coyle and it will be exciting to watch his development. The NHL regular season schedule was released on Friday. Check out our partners at TiqIQ for the best deals on Minnesota Wild tickets for all 2013-14 games.